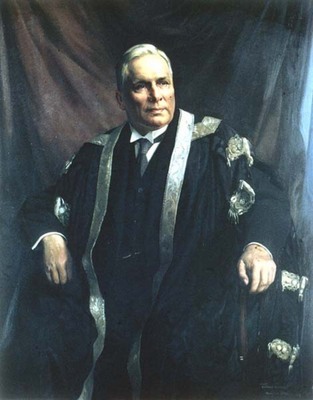 Sir Robert Sangster Rait (1874-1936) was Professor of Scottish History and Literature, 1913 to 1930, and Principal from 1929 until 1936. He was awarded an LLD by the University in 1930. Born in Narborough in Leicestershire, Rait graduated MA from King's College, Aberdeen in 1894. He obtained a First in Modern History at New College, Oxford where he became a Fellow in 1900. Soon after his appointment to the Glasgow chair, he served in the war trade intelligence department during the First World War, and was awarded a CBE. Rait was responsible for leading the University through the difficult years of the Depression, when the number of students fell sharply along with revenues. He was Historiographer Royal for Scotland, 1919 to 1929, and he was a trustee and, from 1932, Chairman of the National Library of Scotland. He was knighted in 1933. Born 10 February 1874, Narborough, England.